Each year, the discourse on global oil production intensifies; critics have been vocal about its dirty, finite and dangerous properties, or its place in a capitalist society which is reliant on unremitting assembly. 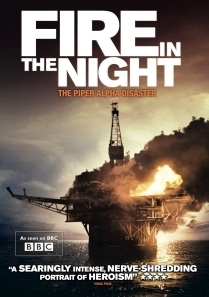 It would therefore be straightforward to apply these arguments to Anthony Wonke’s documentary Fire in the Night (2013), a sensitive retelling of the explosion that occurred on 6 July, 1988 on the Piper Alpha platform. But Wonke’s poetic and solicitous film, based on a book by Stephen McGinty, relives the tragedy in a deeply personal way, interviewing those who survived, and is actually richer for the absence of politics. Located off the east coast of Aberdeen and owned by Occidental Petroleum, Piper Alpha provided 10% of all North Sea oil production and at the time was channelling 300,000 barrels of oil per day. In a tragic way, the sheer scale of the operation contributed to the rig’s doom as two explosions, the first which released up to 30 tons of gas per second, and the second instantly feeding 1280 tons of gas into the fireball, engulfed the platform. What’s strange is that despite these explosions being captured on film, it’s hard to process them – a lot like the utter disbelief when watching the Twin Tower suicide attacks. Wonke uses a mixture of archive footage, talking heads and reconstructed scenes to revive the experience, aided by a gorgeous classical soundtrack composed by Andrew Phillips. Fire in the Night is by no means exploitative however – more discerning, enlightening and earnest. David Ferguson, Brian Neave, Richard Niven and others timeline the events with great clarity, as if this had all happened yesterday. As they get deeper into their escape, heartache resurfaces, and many of the men find it hard to contain their grief. It’s a hard watch, shattering yet unreservedly compassionate. Returning to the political issue, the introduction of journalistic enquiry here would shift the entire mood and objective of the film. To seek out and grill government ministers or Occidental executives would indeed shed even more light on safety procedures, but this is perhaps more suited to an altogether different conquest. Fire in the Night exists as a cinematic memory of a fatal preoccupation with manufacturing, a devastating price to be paid for our obsession with oil. It’s a tribute to the bravery, duty and survival of the oil riggers who somehow travelled through Hell – not over-sentimental or wrought with accusation – but point-and-shoot filmmaking which unravels the nature of its topic. There’s also something mythological and eternal about this story. An oil platform erected on the sea bed, crewed by humans who are out to mine precious substances from the Earth. They’re locked in battle with the crushing force of the sea, the unrelenting battery by the elements, all for a result which will in all likelihood damage Mother Nature even further. When the rig is shown finally being torn down, the shot of the water swallowing up that giant steel frame, leaving no evidence of its existence, serves as an eerie form of closure to Wonke’s Fire in the Night. The scars of the disaster live on through the men and in the history books but the site is absent, the haunting images of the fire seemingly washed away.